Neonatal aortic arch thrombosis is a rare entity and usually of idiopathic etiology. It can simulate aortic coarctation and can be potentially life-threatening with significant morbidity. , In review of literature, only few cases of spontaneous neonatal thrombosis have been reported till date. Management options are varied depending on the etiology, extent, and onset of the thrombus. Therapeutic modalities include thrombolytic therapy or surgical thromboendarterectomy. We report a case of neonatal aortic arch thrombosis in one of the twins, who was successfully operated. A 3-day-oldmale baby, one of the twins, presented with pallor of lower extremities and diminished femoral pulses. He was born to a healthy primigravida at 36 weeks of gestation. Antenatal history was uneventful. There was no history of maternal diabetes, chorioamnionitis, or umbilical vessels cannulation. No family history suggestive of intravascular thrombosis. Clinically, the child was neurologically active, weighed 2.15 kg, and showed no evidence of respiratory distress. The other twin was normal. 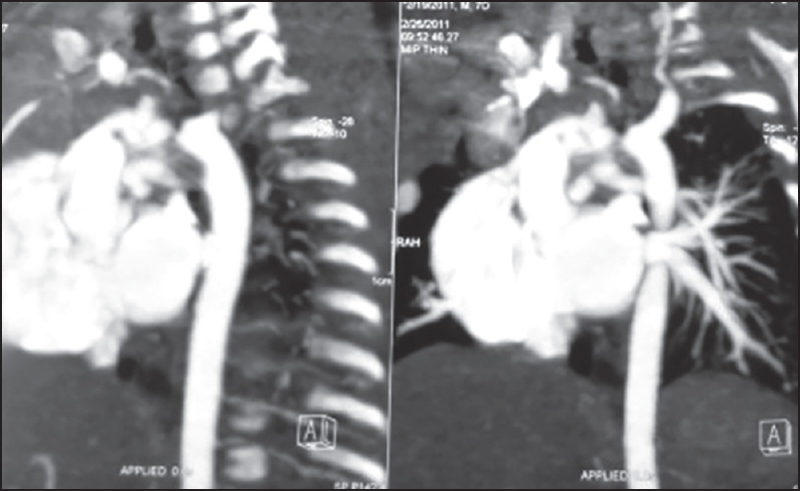 Transthoracic echocardiography showed a large thrombus in the arch of the aorta involving neck vessels [Figure 1] with partial recanalization. There was left ventricular hypertrophy with good ventricular function and the measured peak gradient across the obstruction was 35 mmHg (systolic blood pressure (BP) 60 mmHg). Computed tomography confirmed the thrombus in the arch of the aorta extending from the innominate to the left subclavian artery [Figure 2]. There were no clinical or biochemical evidence of renal impairment or bowel ischemia. Hematological investigations were normal with negative sepsis screen. Coagulation studies, antithrombin III, and protein C and S levels were normal. Medical treatment was not attempted considering the size of the thrombus involving the neck vessels and hyperechogenic nature suggested organized thrombus. The obstruction was deemed critical, and hence surgical option was considered urgent. It was decided to perform the surgery on cardiopulmonary bypass (CPB) with total circulatory arrest (TCA) under deep hypothermia to allow for the best possible chances of total removal of thrombus and to prevent any embolic episodes. The ascending aorta was cannulated well below the innominate artery and thevenous cannula was placed in right atrium. The CPB was initiated very slowly and the neonate was rapidly cooled to 20°C. During the cooling phase the innominate artery, left subclavian artery and the left common carotid were dissected and looped. The aorta was clamped just above the aortic cannula and cold blood cardioplegia was given to arrest the heart. TCA was started with the neck vessels, snared in deep Trendelenburg position. The aortic arch was opened along the long axis extending from ascending aorta close to the clamp proximally, to the descending aorta distally. The thrombus was well-organized along its longitudinal axis and calcified too [Figure 3]. The descending aorta and the left subclavian artery were free of thrombus. 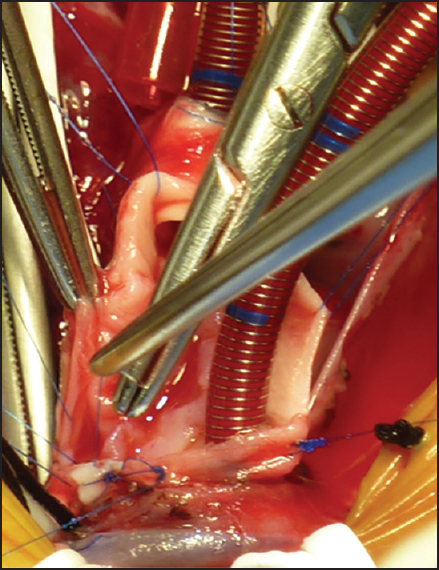 Using a coronary endarterectomy dissector, the thrombus was removed from the aortic arch. The incision was extended into the innominate and the endarterectomy was continued till a clean open lumen was established. The innominate was perfused after endarterectomy, using the aortic cannula inserted into the open lumen and snaring the same. The thrombus was organized and came off easily leaving behind the media and adventitia [Figure 4]. The endothelium was fixed with interrupted sutures taken inside out along the proximal and distal ends and also along the branch vessels. 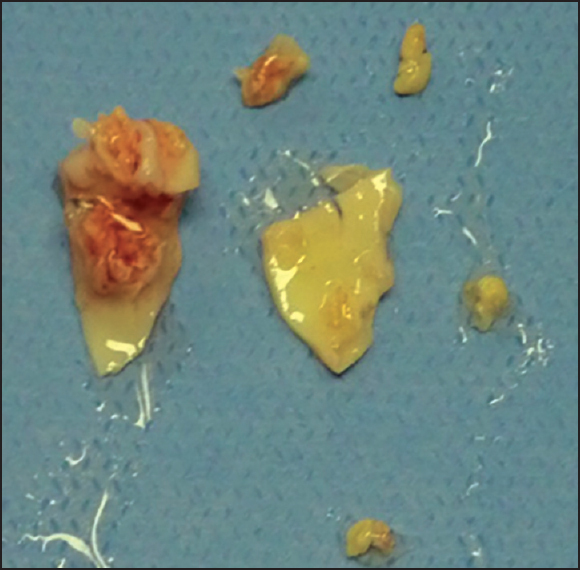 The whole incision was patched with a piece of autologous pericardium treated with glutaraldehyde. Thrombus was calcified and removed completely during surgery, hence no anticoagulation was given and baby was extubated on day 2 after surgery. Postop two-dimensional (2D) echo showed normal arch anatomy with laminar flows. The recovery was uneventful and the child was discharged on day 7. At discharge the child was feeding well and showed no obvious neurological deficits. Last, when followed-up telephonically for 15 min, the child was competing well with its twin brother and developmental milestones were appropriate for the age of 1 year. Neonatal aortic arch thrombus though, a rare entity can develop either intra- or extrauterine. The incidence is not known; however, the incidence of symptomatic neonatal arterial thromboembolic disease is reported to be approximately 0.25/10,000 live births, with 90% of these associated with arterial access devices. In infants with aortic thrombosis, irrespective of treatment, mortality is high around 33%. Successful surgical repair with survival beyond the immediate postoperative period has only been described in two cases. This is a unique and rare presentation of a baby who underwent successful surgery and probably the first to undergo thromboendarterectomy extending into neck vessels with arch reconstruction. lipid deposition and calcification and plaque formation as part of atherosclerosis; however, not reported in literature. There is paucity of literature in each case report, and hence there is no accepted gold-standard treatment. Various treatment options are used in all the described cases, with varying results. Untreated patients have near 100% mortality. Immediate survival also depends on comorbidities like renal, brain, bowel ischemia. Survival rate in various series are surgical thrombectomy 67%, anticoagulation (low-molecular-weight heparin (LMWH) or unfractionated heparin) 80%, and thrombolysis 75%. The high mortality in majority of medically managed patients suggests that, the medical management is of limited value; probably only to tide over the initial crisis. Majority of surgically managed patients survived and one had rethrombosis  suggesting that surgical intervention would be the best option. Three had only thrombectomy of which one had recurrence and other two had neurologic sequelae, suggesting that thromboendarterectomy with complete removal of all thrombotic material was the best possible line of management. We feel that all these patients should be treated aggressively with surgery, ensuring a complete removal of thrombotic material from all the branches. Thrombosis of the arch in a neonate is a very rare disease, of variable etiology. There is no consensus of definitive treatment, but management options should be individualized. Overall early detection and appropriate treatment has evidenced good results. de Godoy JM, De Marchi CH, Silva MG, Carvalho MC, Moscardini A, Medeiros JC. Thrombosis of the abdominal aorta in a newborn: Case report and review of literature. J Pediatr Surg 2003;38:E11. Rodriguez M, Sosenko I. Catheter-induced aortic thrombus masquerading as coarctation of the aorta. Clin Pediatr (Phila) 1989;28:581-4. Guenthard J, Wyler F, Nars PW. Neonatal aortic thrombosis mimicking coarctation of the aorta. Eur J Pediatr 1995;154:163-4. Evans DJ, Pizer BL, Moghal NE, Joffe HS. Neonatal aortic arch thrombosis. Arch Dis Child 1994;71:F125-7. Sánchez J, Velasco F, Alvarez R, Román J, Torres A. Aortic thrombosis in a neonate with hereditary antithrombin III deficiency: Successful outcome with thrombolytic and replacement treatment. Acta Paediatr 1996;85:245-7. Hagstrom JN, Walter J, Bluebond-Langner R, Amatniek JC, Manno CS, High KA. Prevalence of the factor V Leiden mutation in children and neonates with thromboembolic disease. J Pediatr 1998;133:777-81. Hughes GR. The antiphospholipid syndrome: Ten years on. Lancet 1993;342:341-4. Cohen U, Yanai-Inbar I. Neonatal aortic thrombosis. A case description and an explanation for pathogenesis. Clin Pediatr (Phila) 1978;17:490-3. Uva MS, Serraf A, Lacour-Gayet F, Bruniaux J, Sidi D, Kachaner J, et al. Aortic arch thrombosis in the neonate. Ann Thoruc Surg 1993;55:990-2.